A weekend only lasts so long. Tick, tick, tick. What next? 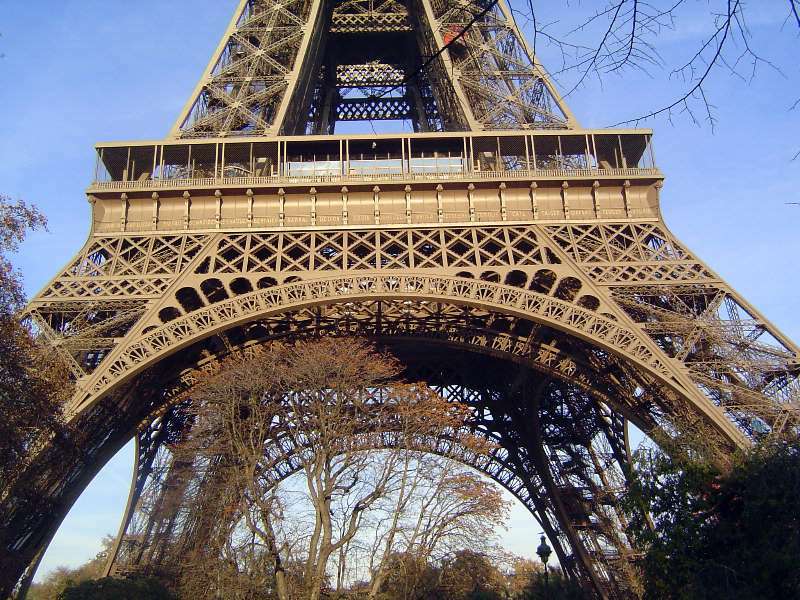 You know we can't avoid the the work of that experienced bridge builder, M. Eiffel. 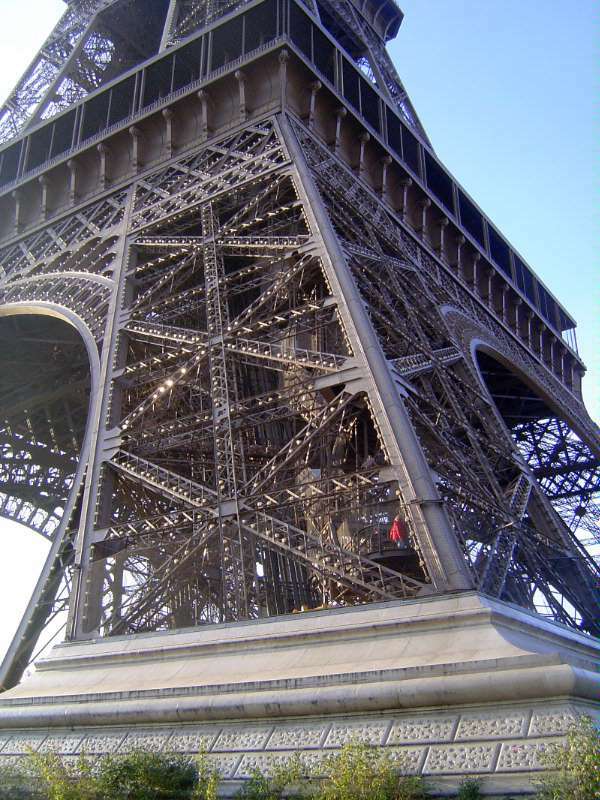 The piers are so massive that the tower's 7,000 tons put no more pressure on a square inch of ground at the base than the leg of a chair does with somebody sitting on it. The base is wide enough that oscillations at the top do not exceed six inches. Less spectacularly, Paris was transformed more profoundly by Baron Georges-Eugéne Haussmann, Prefect of the Seine from 1853 to 1870. The most visible result of his work--more so, say, than the equally valuable business of improving the water supply and sewers--was the clearance of a medieval street pattern and its replacement with many new streets, including boulevards with highly visible monuments at key intersections. 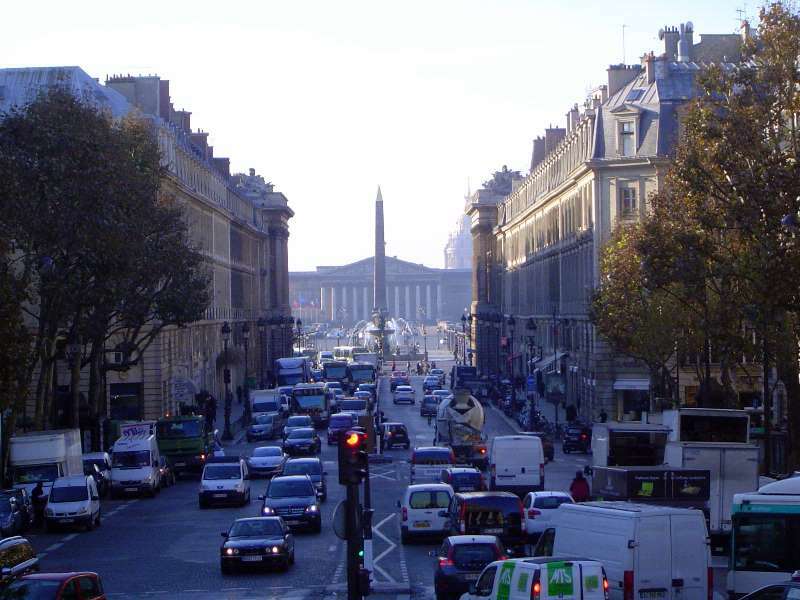 Here, the Rue Royale widens at the Place de la Concorde with its ancient Egyptian obelisk and, beyond, the National Assembly. 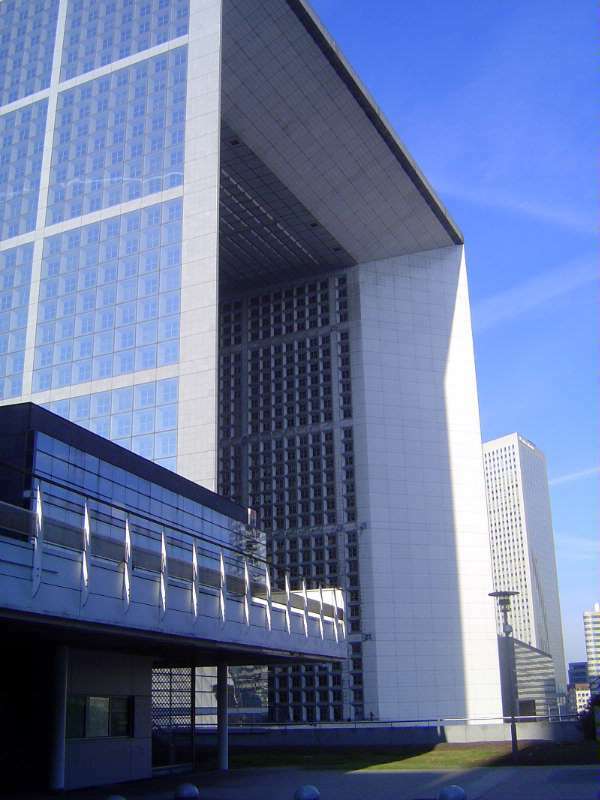 Along with the streets, Haussmann laid down the law about the maximum height of building and about how floor levels should match up, building to building. Although his rules were gradually eased, the result is still plain in the "street walls" he created, in this case along the Avenue Elisée Reclus, just north of the Eiffel Tower. Shopping for a flat? 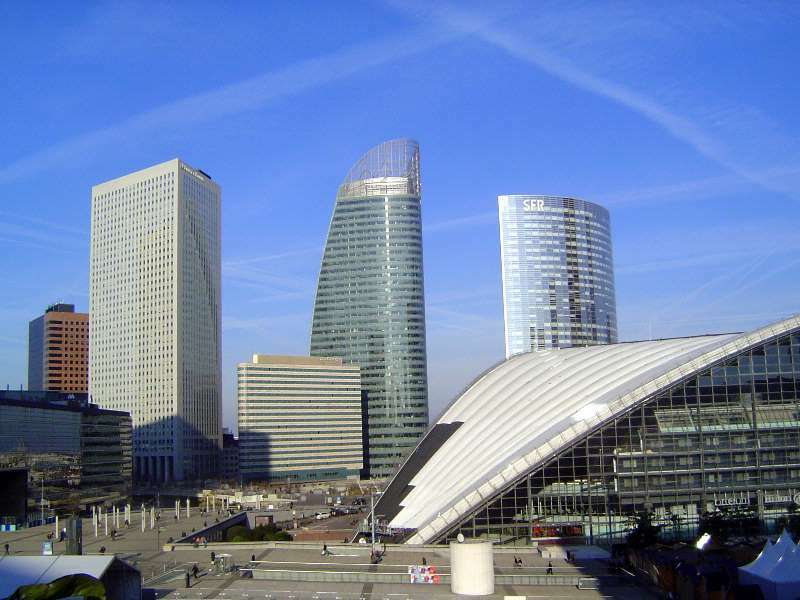 The average price here in 2012 was 15,000 euros per square meter. That's pretty near the top of the scale and twice the Paris average. Parking must be a snap. 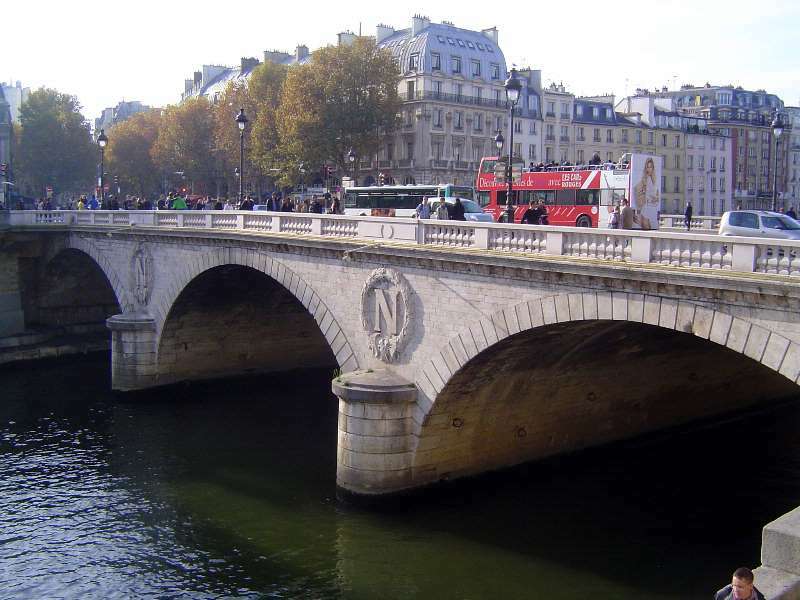 Haussmann rebuilt bridges, too, including here the Pont St. Michel, completed in 1857. What could the N stand for? No wonder the French think that Americans are barbarians. 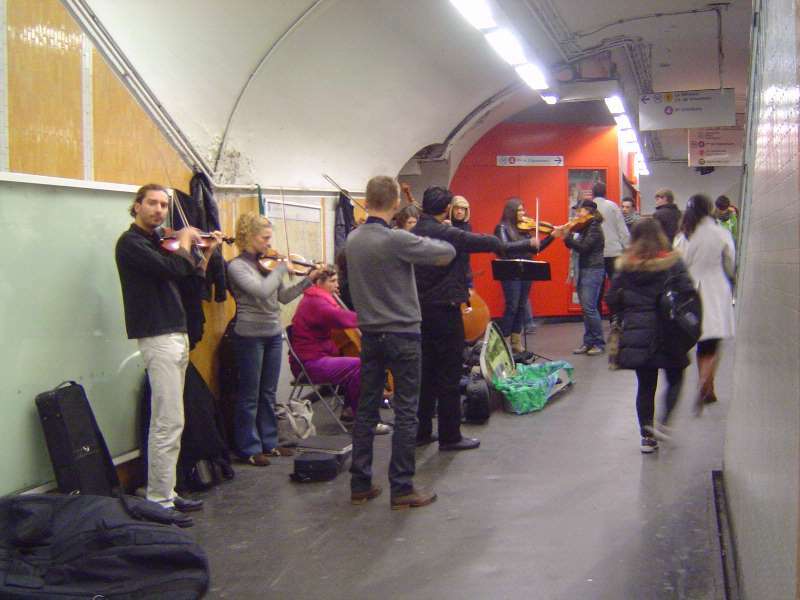 Here, with great acoustics, chamber musicians perform to a very high standard. 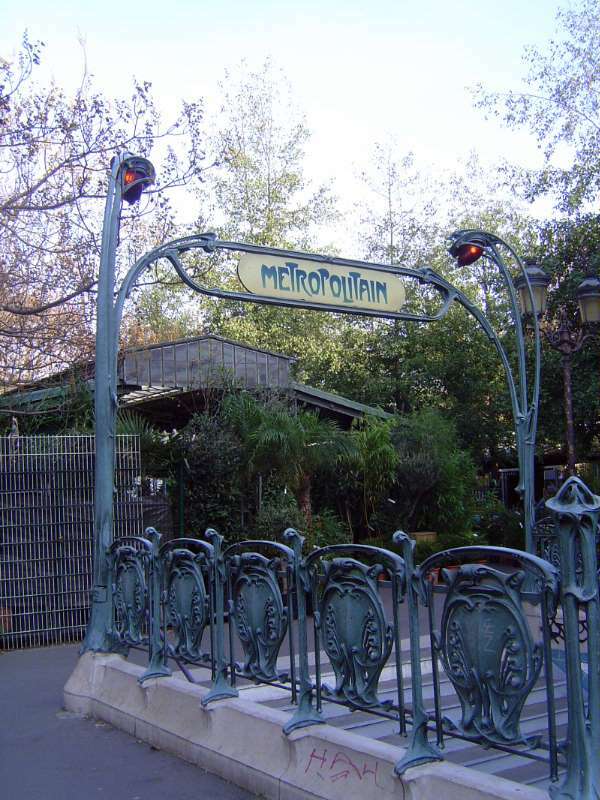 A few bits survive of Hector Guimard's Art Nouveau ironwork at the metro stations. The style, though it looks old, was daring at the time because it broke away from the models that had dominated architecture for centuries. Oddly, Guimard's whiplash curves were derived from the ornamental pattern book of Viollet-le-Duc. An optimistic sign. 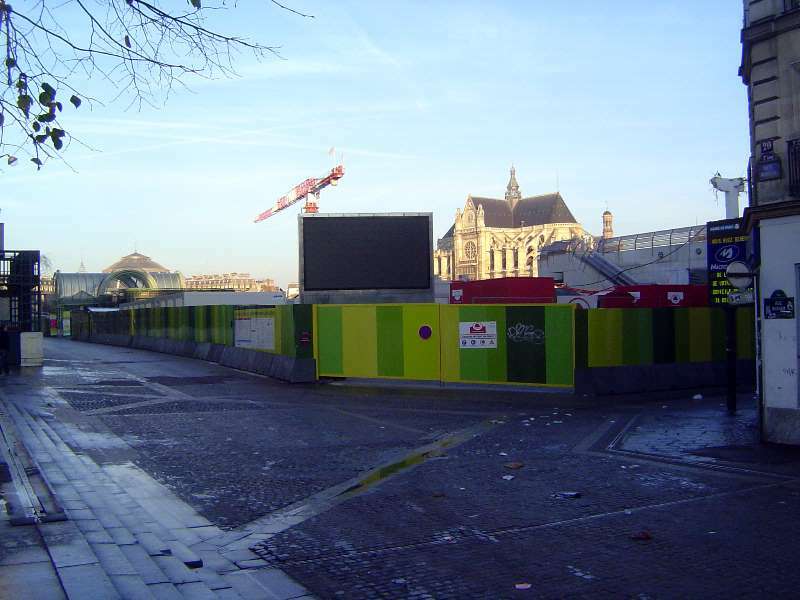 The round building at the right side of the site is the bourse. And here we are in the Forum. It's early Sunday morning. Try to find your way out. Crews periodically sweep the place for the bleached bones of those who couldn't. The sky creates the illusion that this must be near an exit. It isn't. It's only a courtyard four storeys below the surface and positioned in such a way that the hapless soul can't see the outside world. 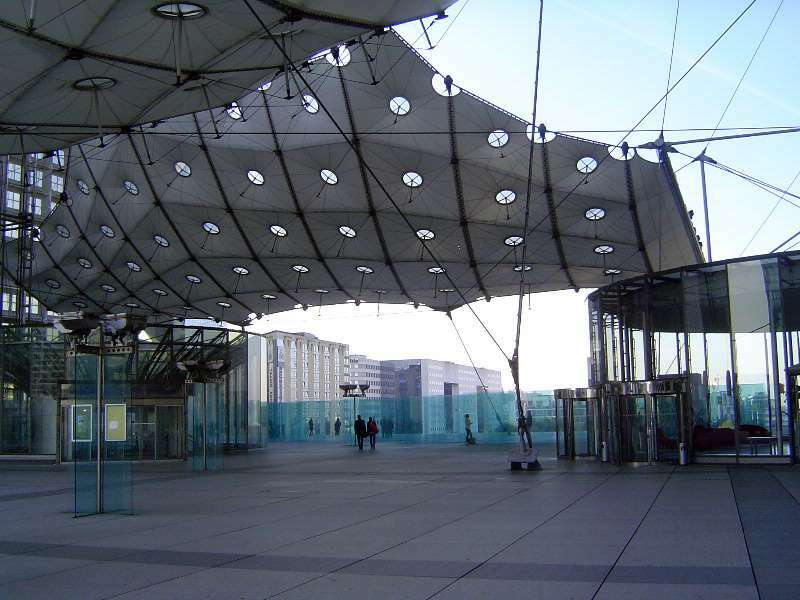 The previous two pictures looked at the Forum Des Halles proper, by Claude Vasconi and Georges Pencreac'h. It covers the east half of the site. 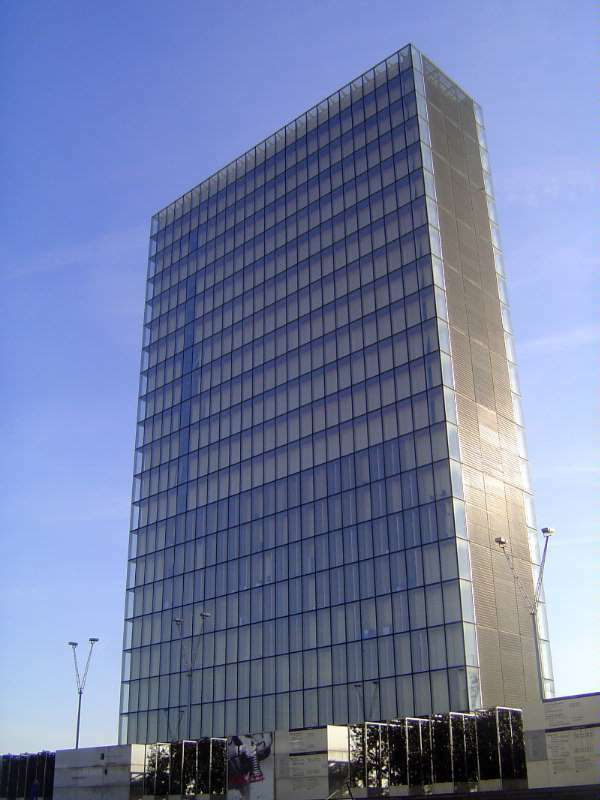 Jacques Chirac soon became mayor and declared himself chief architect. 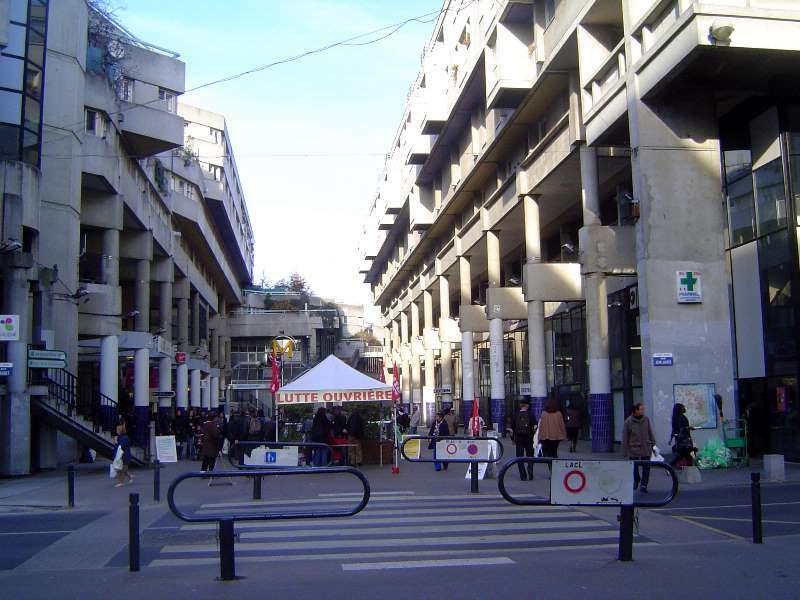 The result was architect Paul Chemetov's adjoining New Forum des Halles, on the west half of the site Better? 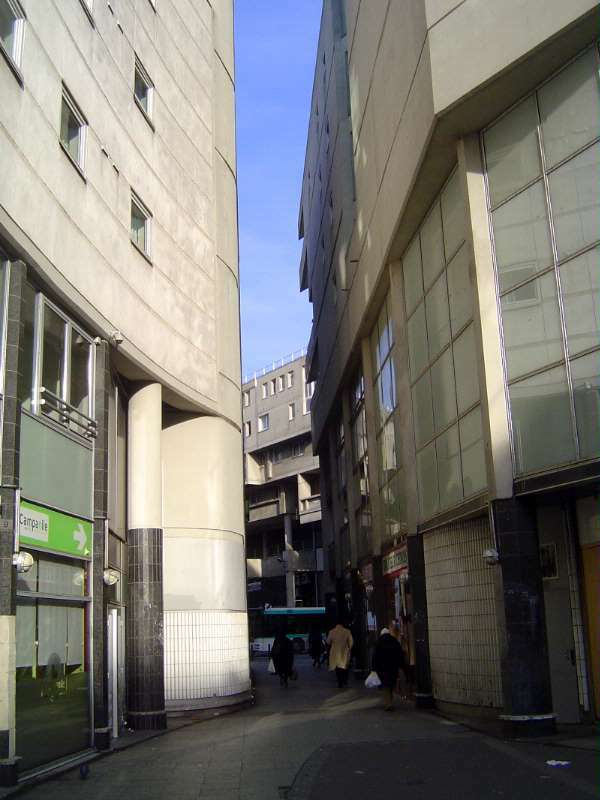 Ayers writes of the "grey, troglodyte, underground-car-park feel to the main public spaces" (p. 55). Five hundred feet to the east is the Centre Georges-Pompidou, alias the Beaubourg or perhaps the world's first urban oil refinery. 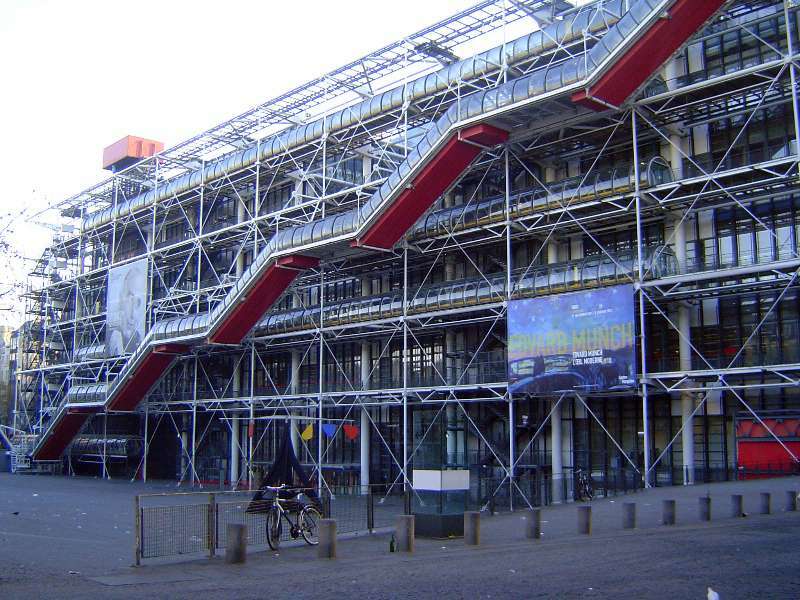 Georges Pompidou didn't much like the design by Renzo Piano and Richard Rogers, but that's who the jurors, including Philip Johnson and Oscar Niemeyer, chose. The logic of the structure was simple: by putting all the utilities outside, the inside could be unobstructed space. 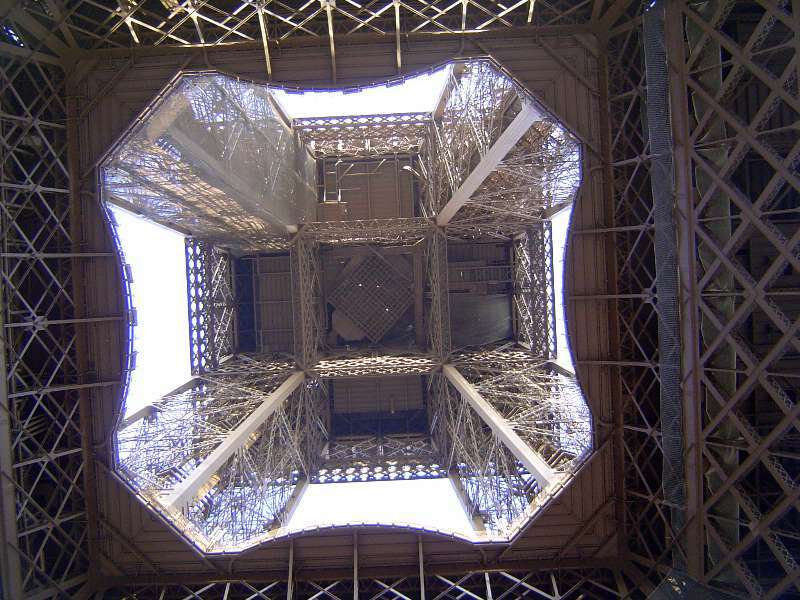 One downside was that maintenance costs were high because so many parts were exposed. In addition, as Ayers writes, the building seemed to be "the architectural equivalent of sticking your tongue out at your elders and betters" (p. 96). Resistance was strong not only from the artistic community but from builders, which is why the materials, including huge underfloor girders, were made by Krupp in Germany. 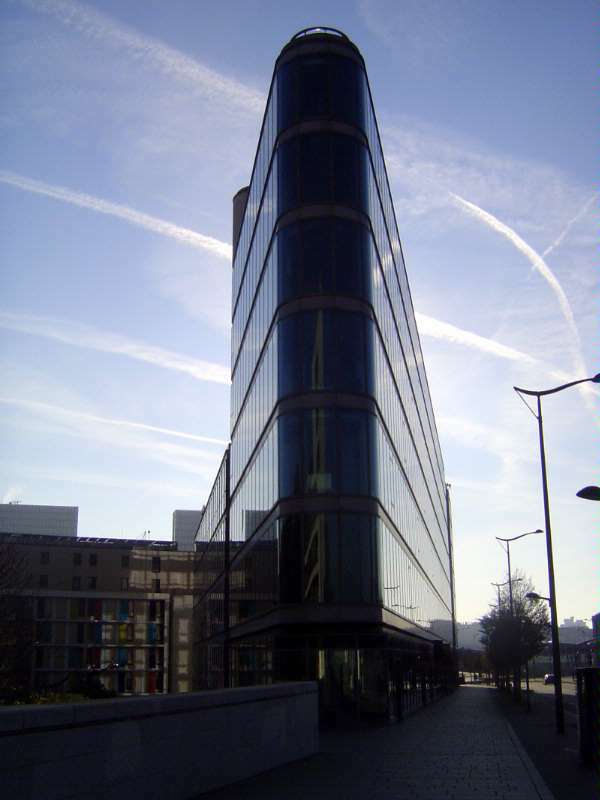 The building has proven highly popular, however, with the "caterpillar" escalators attracting people with no interest in the modern art on display inside. 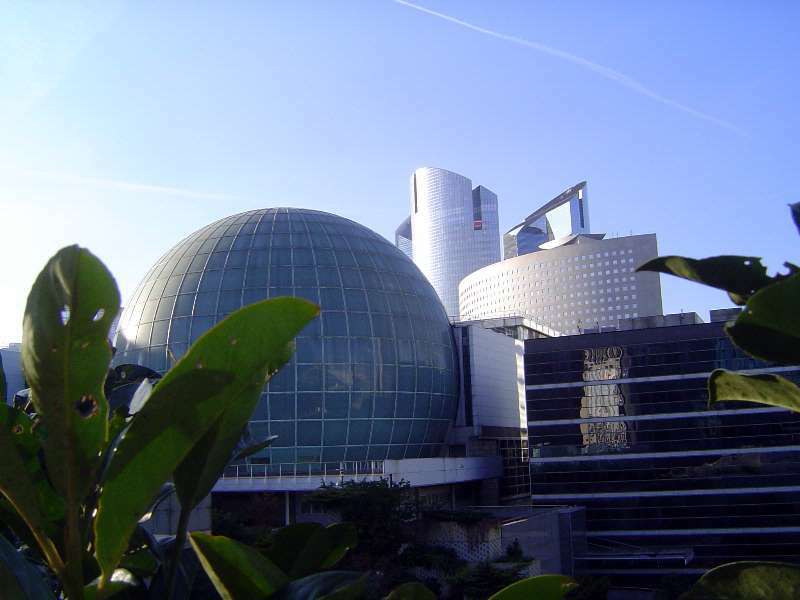 The building boosted the whole neighborhood, and this "Beaubourg effect" may help explain why Bilbao turned to Frank Gehry. We're back at St. Denis, not for the basilica this time but for the neighborhood around the Metro stop. 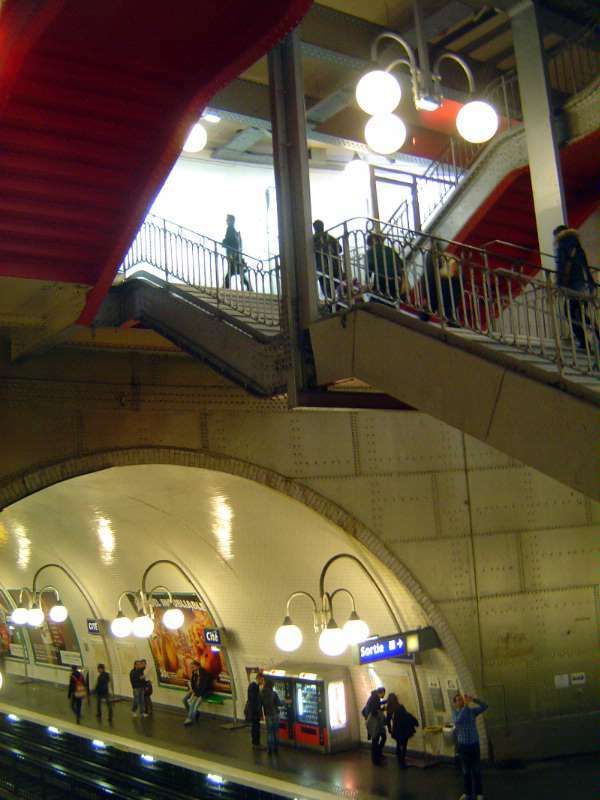 The metro exit dumped us in that narrow Passage de l'Aqueduc. No time to work out the story there. We've moved forward fifty yards to look back. There must be a French phrase for cheese-wedge apartment blocks. A block away, we're on Rue Jean Jaurès. That may not ring a bell right away. Suppose I say that a block to the north is Rue Auguste Blanqui. Nothing? 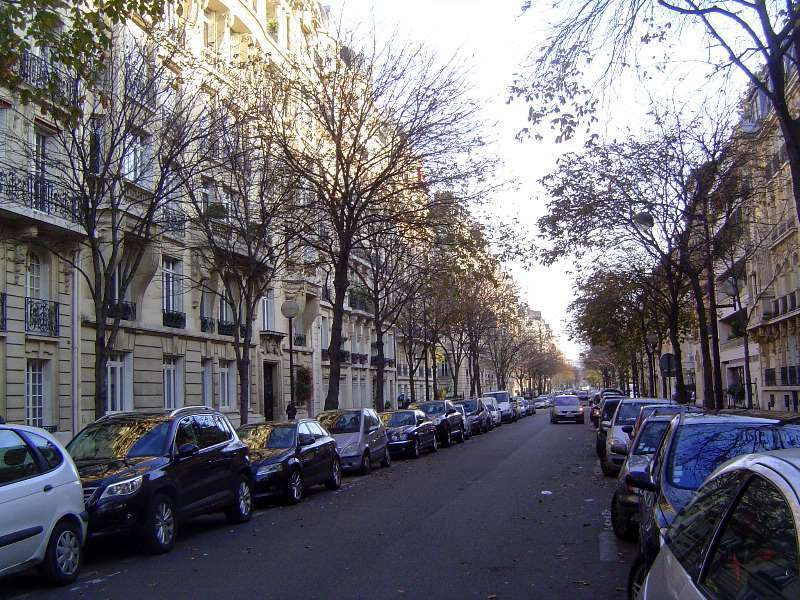 How about the Boulevard de la Commune de Paris? Now we're getting warm. In 1896 St. Denis elected France's first socialist municipal government. By the 1920s it was called the "Red City." 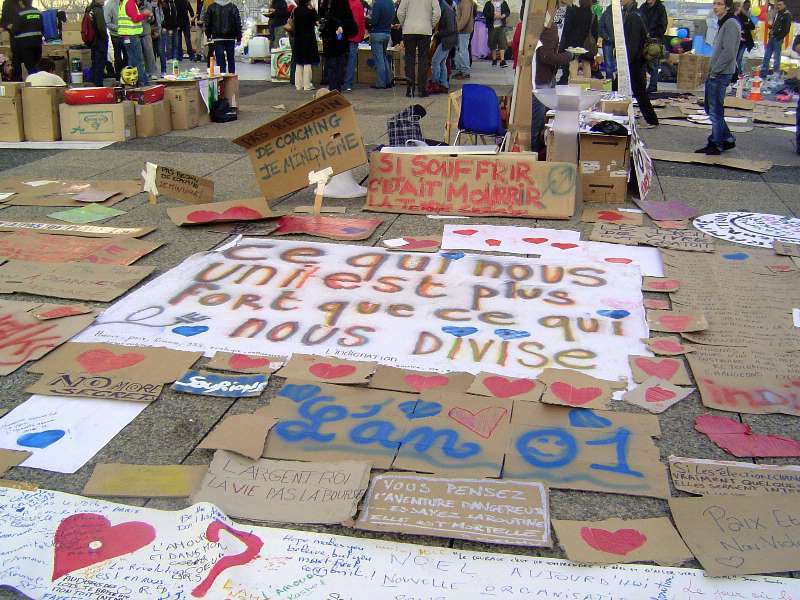 In the 1930s the journalist Augustus Gillot wrote, in the Communist newspaper Humanitè, that "poverty is high in the city of the kings of France." (The newspaper is still based in Saint-Denis.) All of which circles back to poverty, rundown neighborhoods, and a prime spot for urban renwal. With flower boxes, of course. 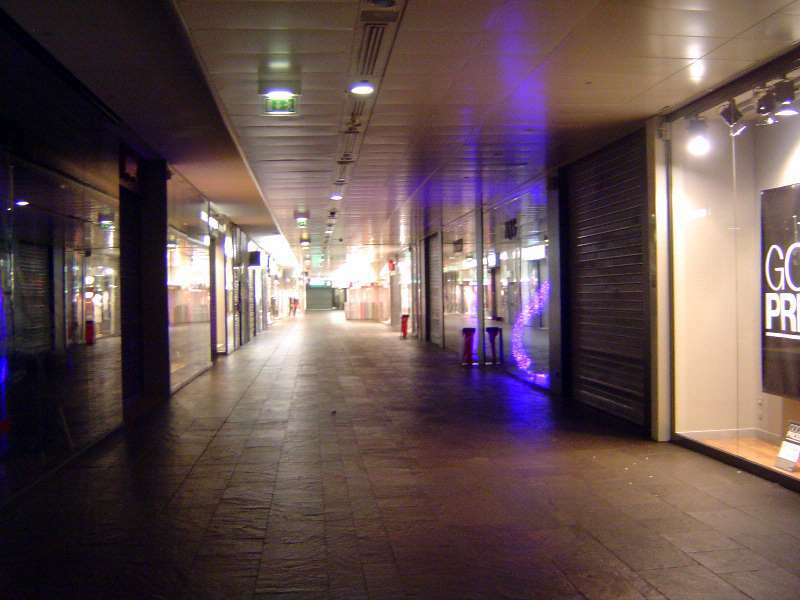 The commercial center of the redeveloped area. 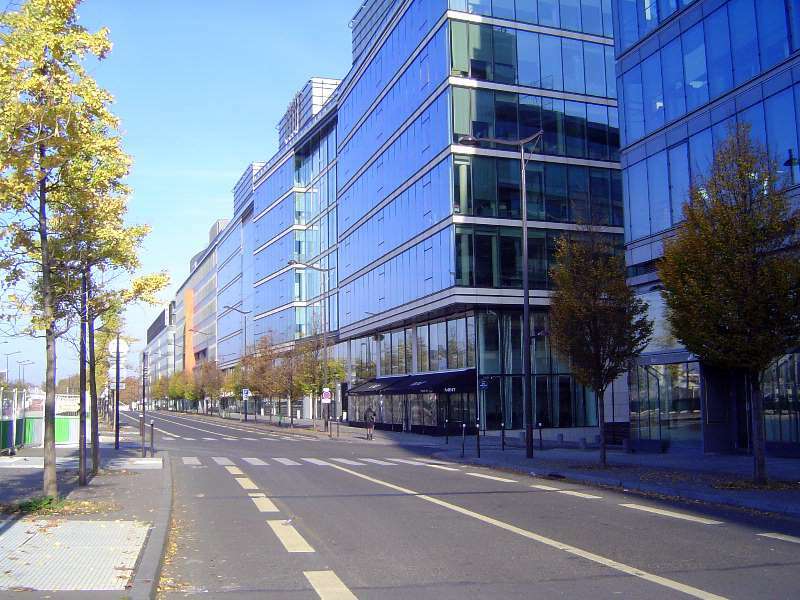 On the right side is a Carrefour. 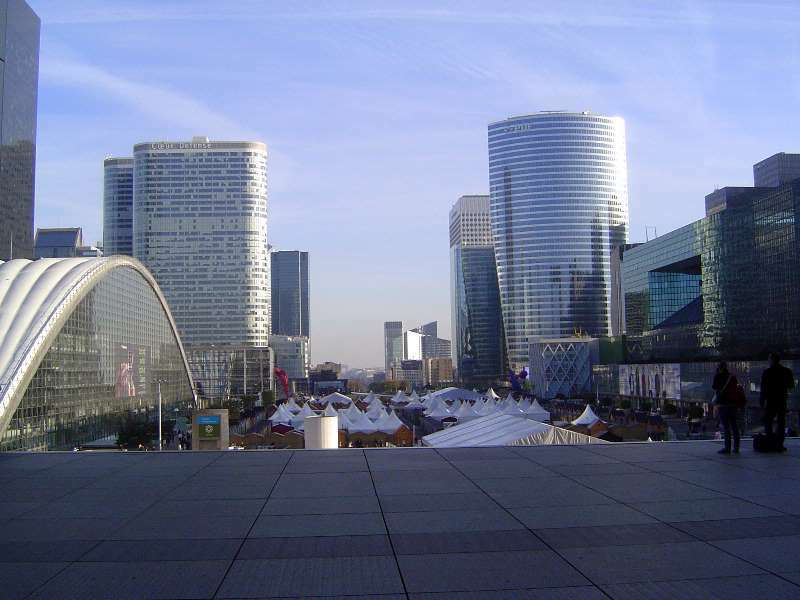 All to the good, but Le Figaro has published statistics showing that Saint Denis has more crime than any other municipality in France. The rate is twice the national average--five times the average for violent crime. 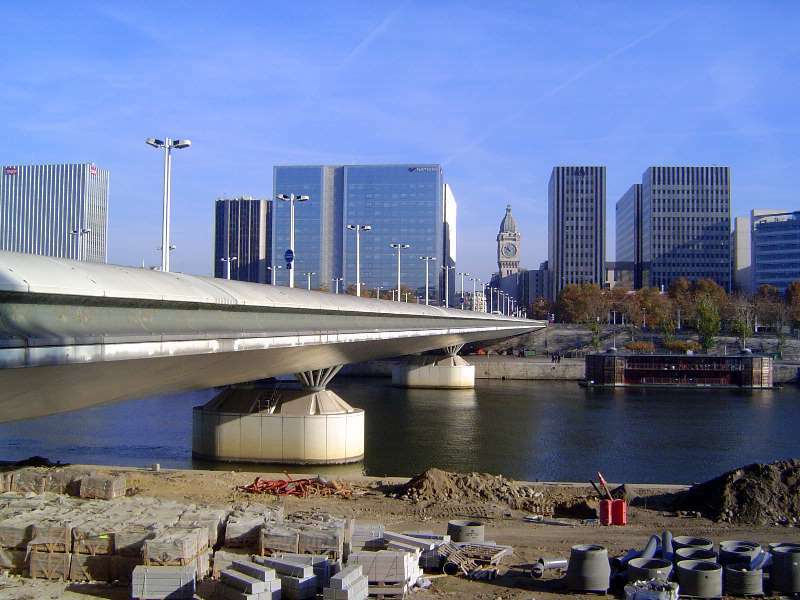 We'll take a look at another modern development, beginning with the Pont Charles De Gaulle, which crosses the Seine at the Gare d'Austerlitz. This bridge leads, behind the camera, into a spanking new avenue called the Avenue de France. Expect something special? Here it is, Paris Rive Gauche. There are lots and lots of offices here, in part because they can pay higher rents than apartments and in part because vibration from the nearby trains makes sleeping difficult. 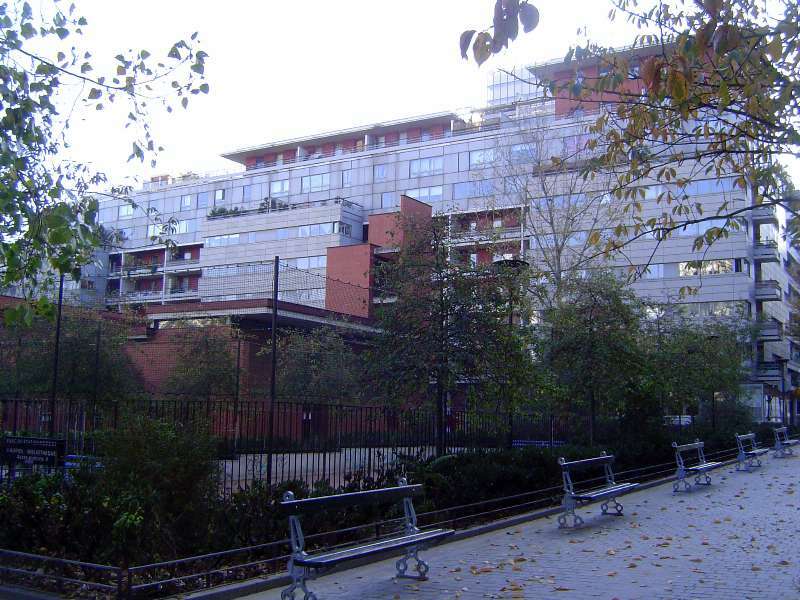 At over 300 acres, Paris-Rive-Gauche is said to be the city's biggest renewal project since the time of Haussmann. 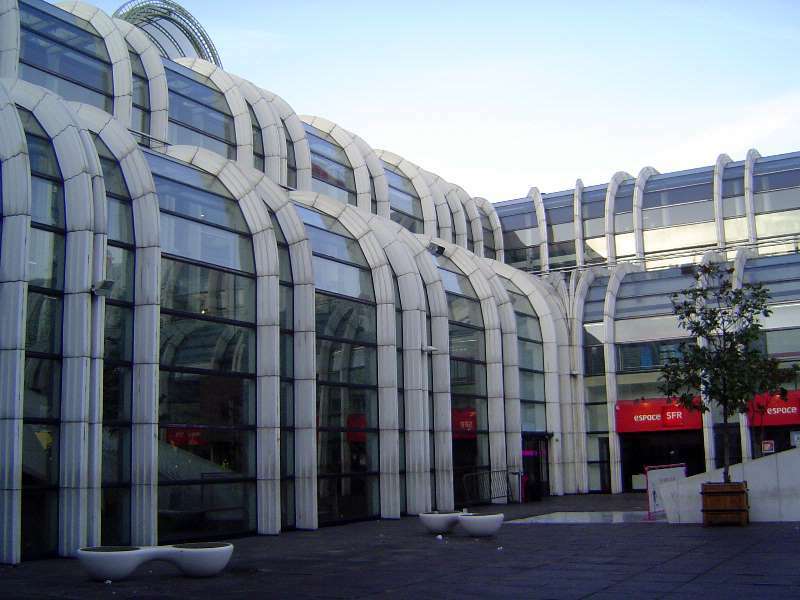 Ayers writes that "nearly all the structures lining the avenue wear the same Cartesian, orthogonal, horizontally orientated steel-and-glass uniform, displaying a maximum of transparent glazing and a minimum of visible strucure" (p. 203). Ayers says that, when complete, this "will be a very slick and sorry place indeed." 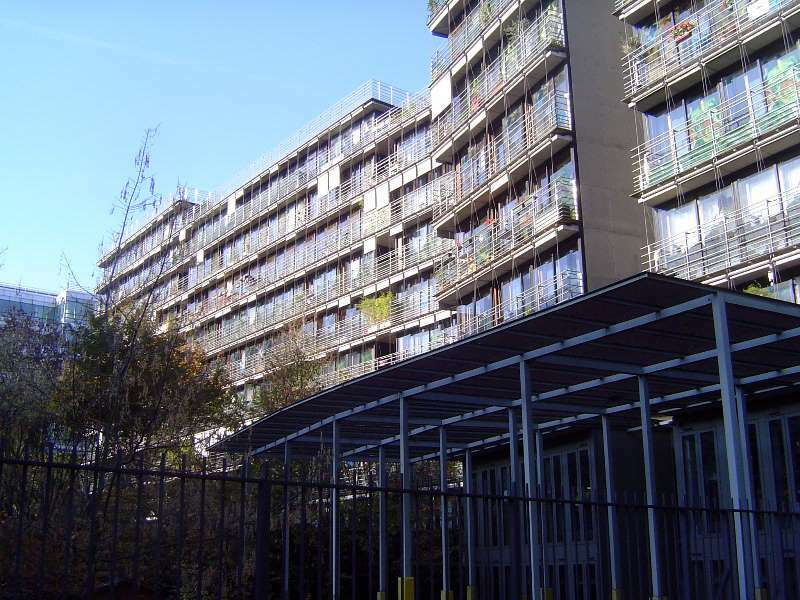 People do live in other parts of the development, for example in Francis Soler's building at 9 Rue Emile-Durkeim. The engine for Paris Rive Gauche is this. Any ideas what it is? Before you give up, stop to love the plants in jail. Here's another view. If it looks like an open book, there's a reason. 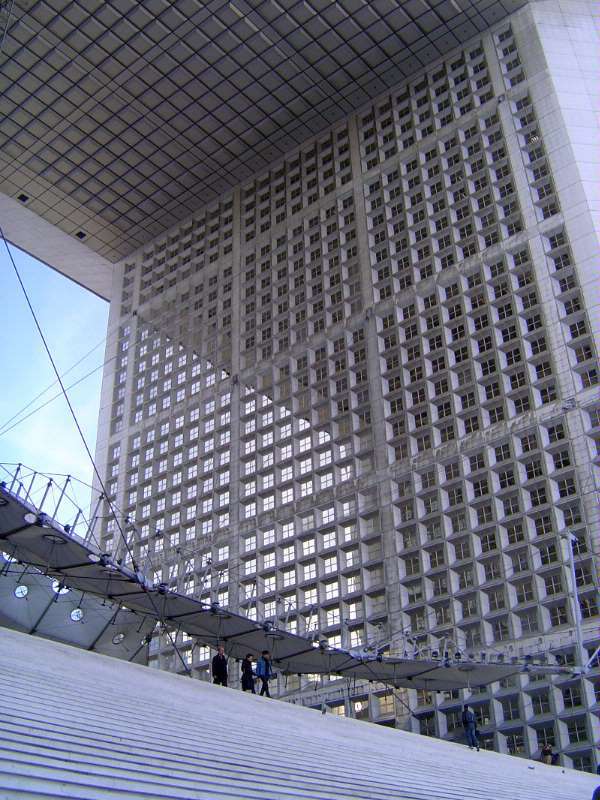 This is one of the four towers of the Bibliotheque Nationale de France, another of Mitterand's grand projects. 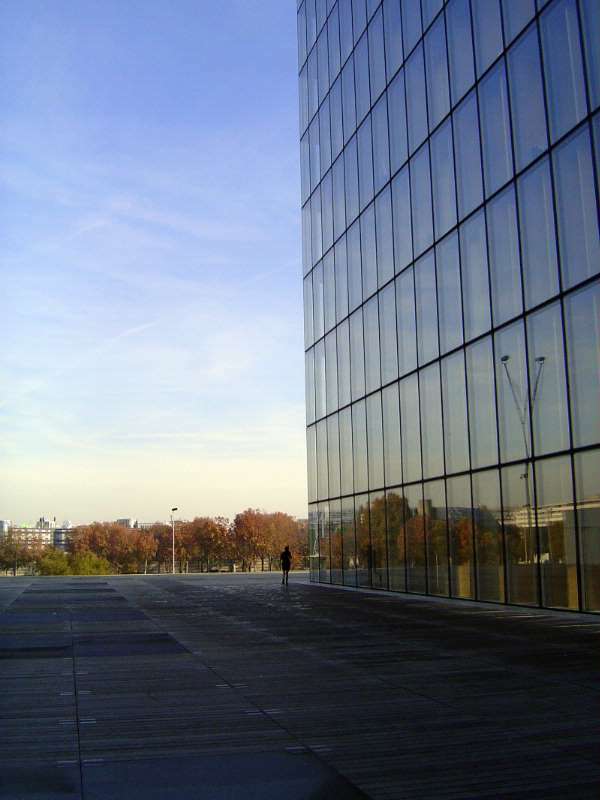 Designed by Dominique Perrault and built between 1989 and 1995, the towers mark the corners of a box with a lovely plaza, seen here, and a sunken courtyard. 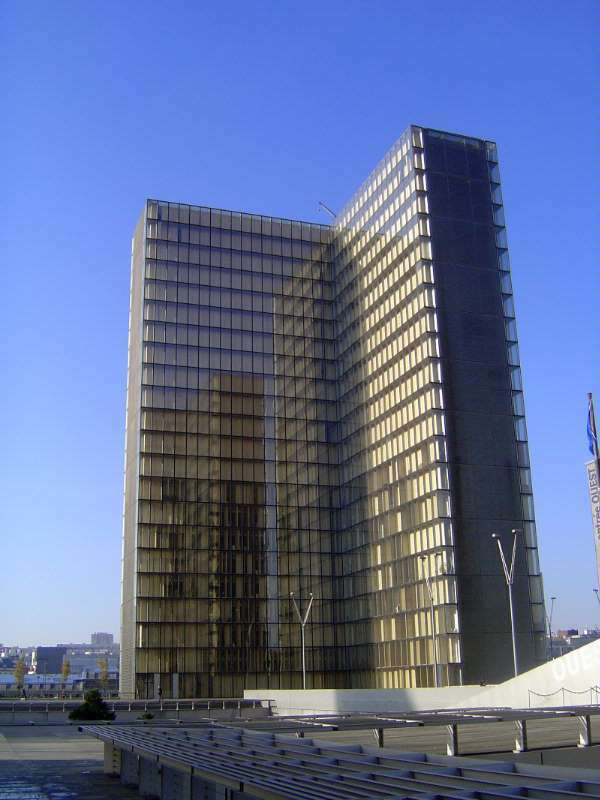 The books were to be housed in the towers, while readers descended into the cloistered hole where they were to read with a lovely view of a garden but not so much as a peek at the Seine, literally across the street. Then someone pointed out that sunlight isn't good for paper. A lot of the books moved downstairs, and a lot of offices moved into the towers. 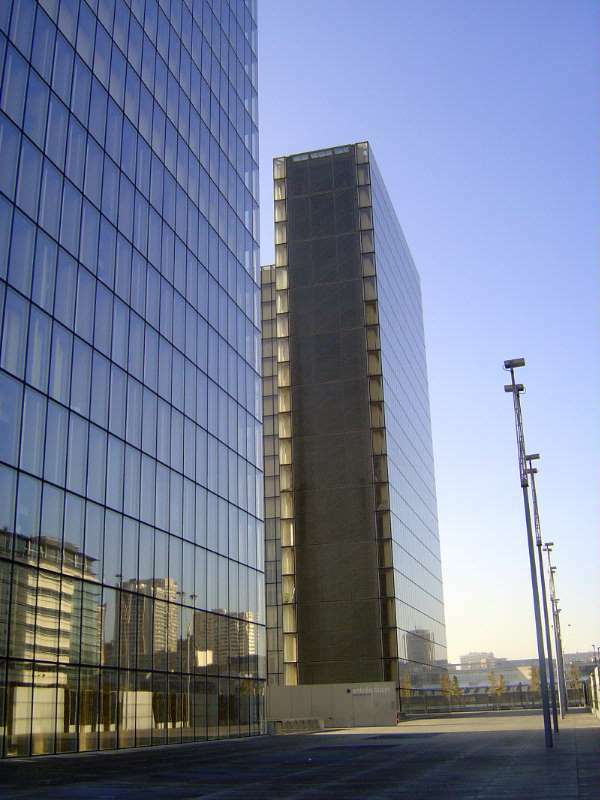 Still, there are plenty of books in the towers, which is why 6,000 tons of specially clear glass made by St. Gobain are now permanently covered by wood shutters. Library offices are scattered over the four corners, making communication awkward. 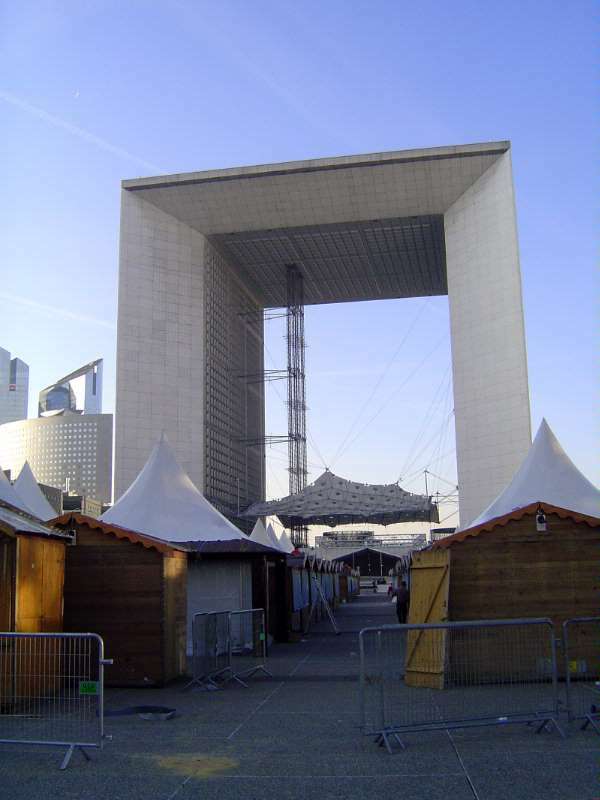 Speaking of slick and sorry, we've come over to La Défense and its iconic Grande Arche. Ayers calls it "an allegory of the universe, in which nature is encompassed by a giant, Cartesian, rational order" (p. 314). Does that mean he likes it? Ayers writes that it strikes some as "commanding, enigmatic and mute, irreproachable in its immaculate whiteness." He goes on to say that "to others it seems supremely ironic that a monument to the 20th century should consist of a gigantic void" (p. 315). I'm betting he doesn't. 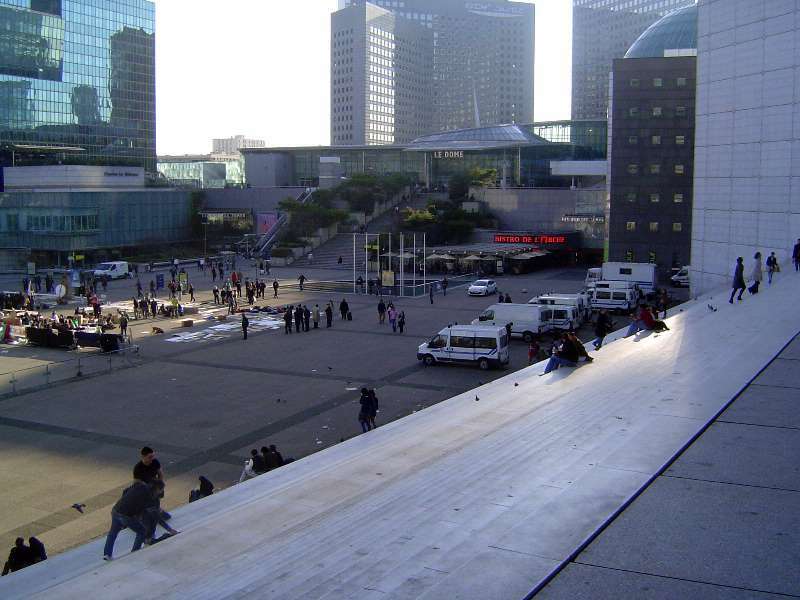 The plaza, called the "plateau," was supposed to have glass clouds. That didn't happen. Instead it has fabric tied down tight so pedestrians don't blow away. The stairs may be fine for sitting, but there is not a railing in sight, and on wet or icy days you'd better watch out. 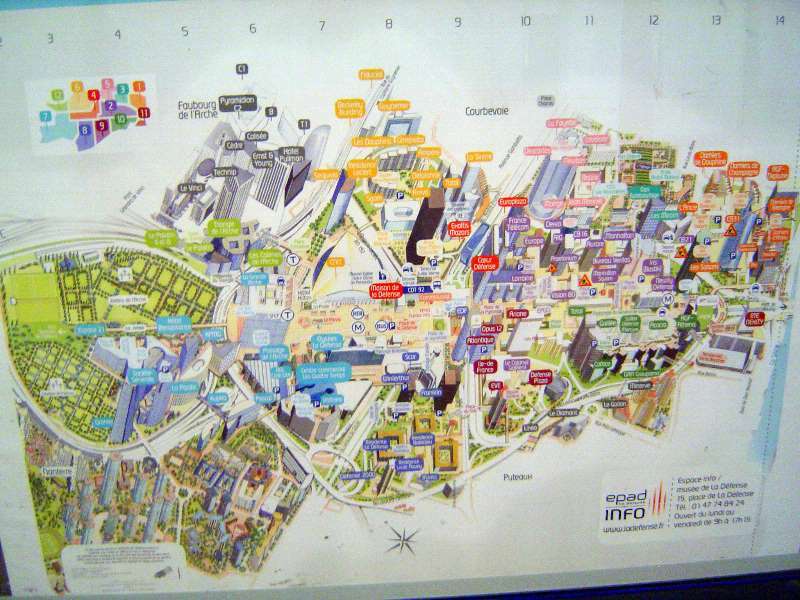 A poster supposedly helps visitors get their bearings. 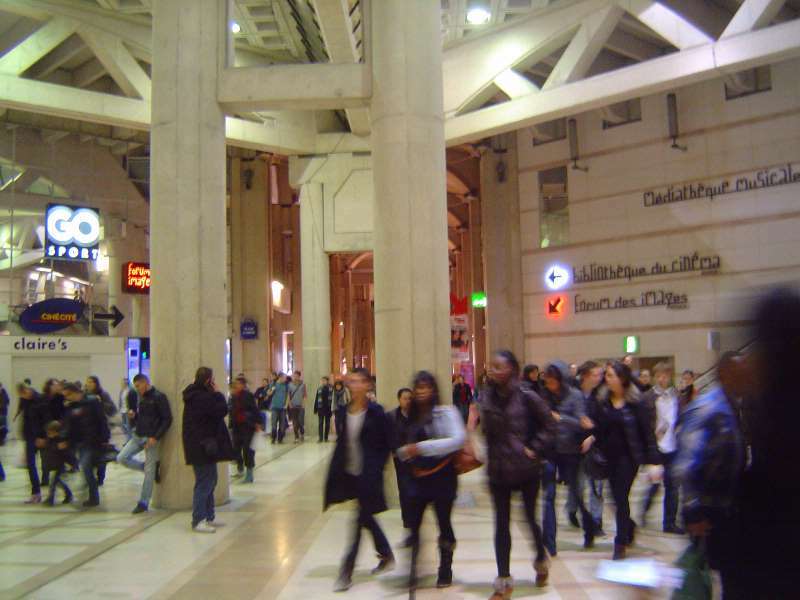 Hint: give yourself plenty of time if you're trying to find the RER station. 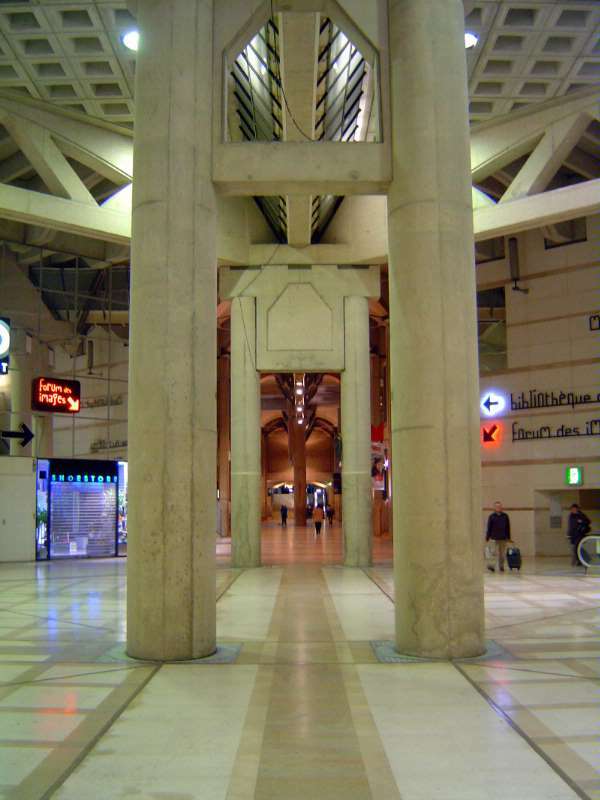 Underground, La Défense makes the Forum look cozy. 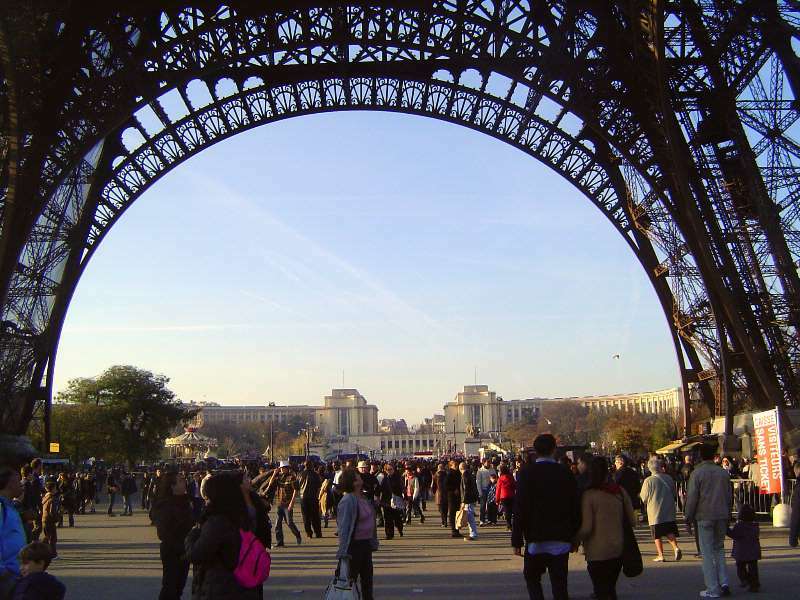 And you thought Paris was all about strolling along the Seine. And now you know where science-fiction goes to die. 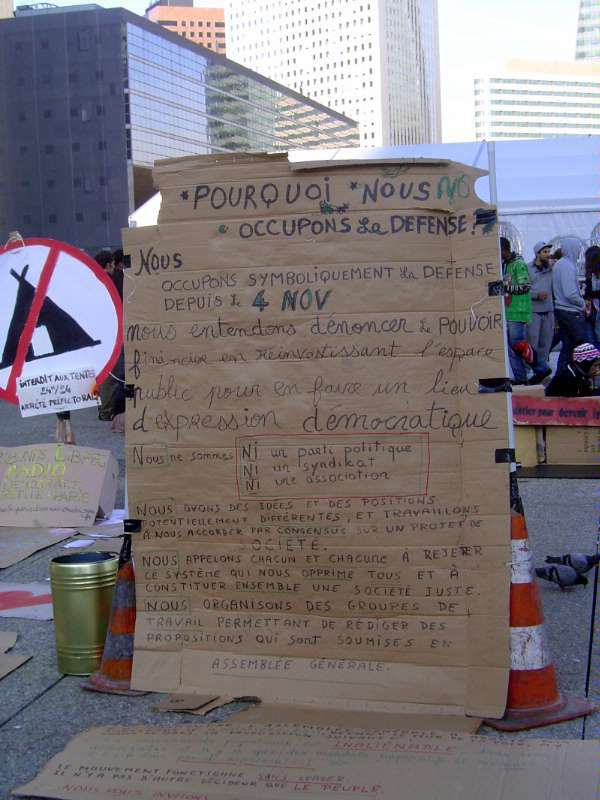 Meanwhile (late 2011), protesters have their own version of Occupy Wall Street. 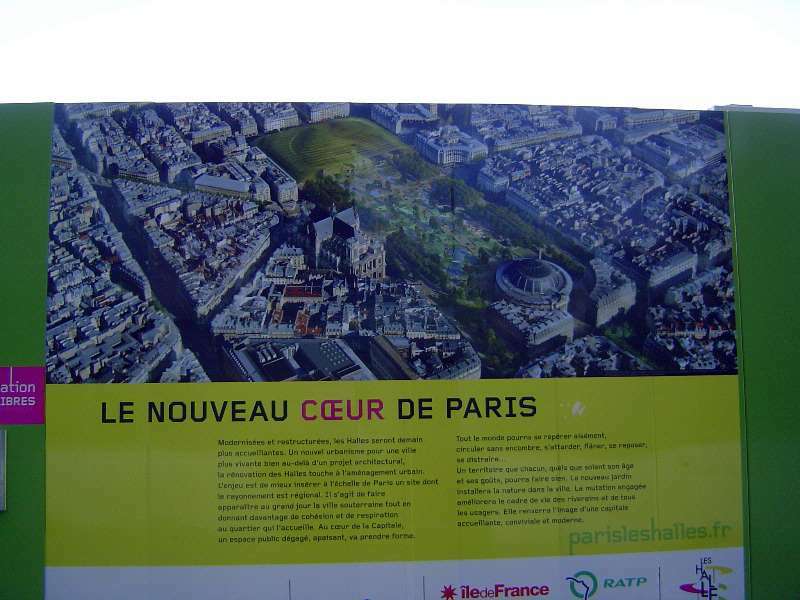 Why on earth would they choose this part of Paris? "What unites us is stronger than what divides us." Think the people in the towers agree? We're done, but not bad for a weekend. Good thing we had good weather. The next day, back in K-town, it was gray again.